Sunday was my last day on Kauai and a breeze -- literally. I woke up early to go on a snorkel picnic to the Na Pali Coast with Captain Andy's Sailing Adventures. At first, I was a little hesitant because I don't swim, but you don't have to snorkel. In fact, there's much more to the tour than just snorkeling! There's plenty of commentary from the guides and the views are to die for. I can't think of a better way I could have spent my Sunday morning on this vacation. I kicked my feet up while inhaling the fresh air, read my magazines, and took tons of photos. 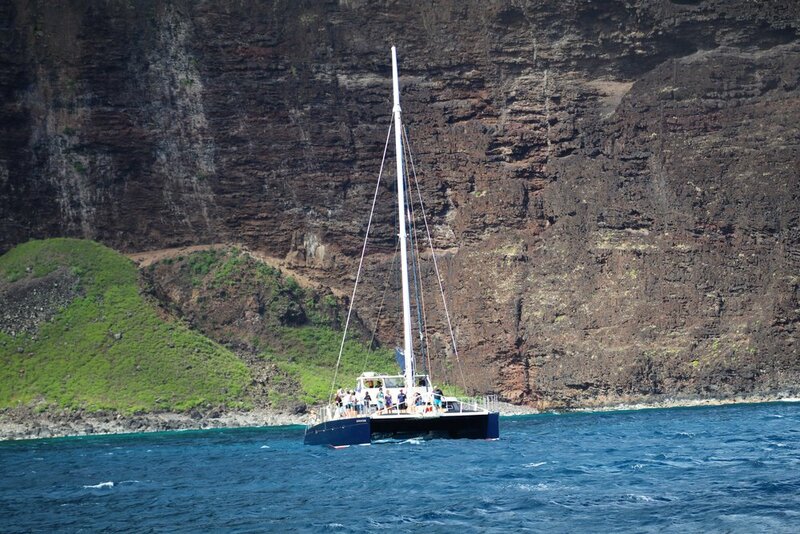 The catamaran sped across the ocean water to transport us to the Na Pali Coast which is approximately an hour-long sail. If you have motion sickness, definitely take some medicine prior to boarding. The tour begins in the morning, so a light breakfast is served. The fruit in Hawaii is seriously the best -- always so sweet and ready to eat. 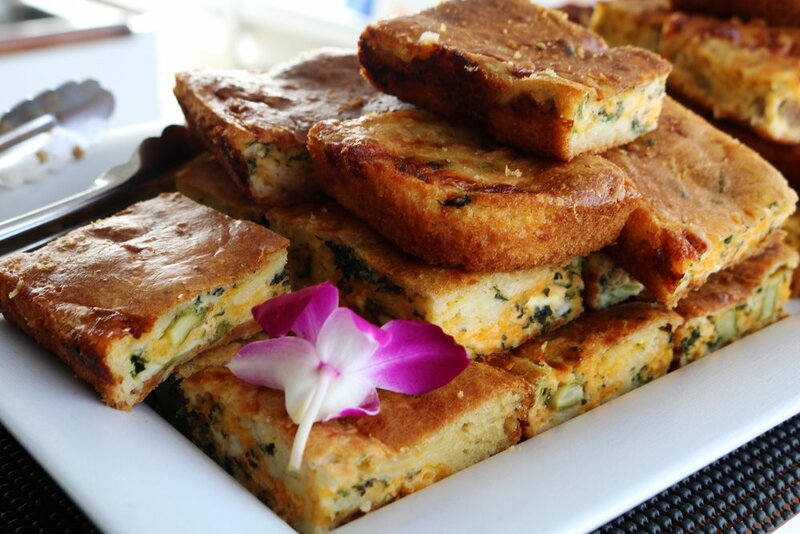 The quiche squares were delicious. We had an option of vegetarian (photographed above) or sausage. While we were sailing, we passed other catamarans full of tourists embarking on similar excursions. 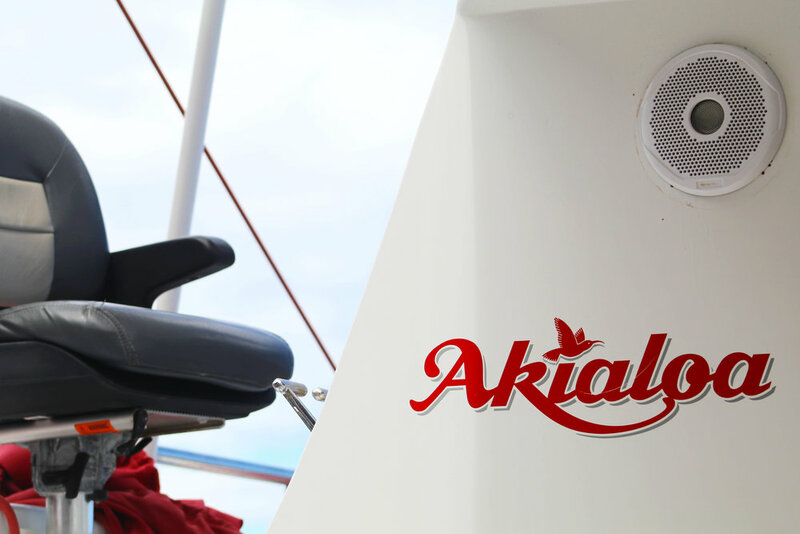 The catamaran was named Akialoa which is actually an extinct Hawaiian bird species. Seeing the island by boat was just as amazing as seeing it from a helicopter. To be so close to the walls of mountains was incredible. 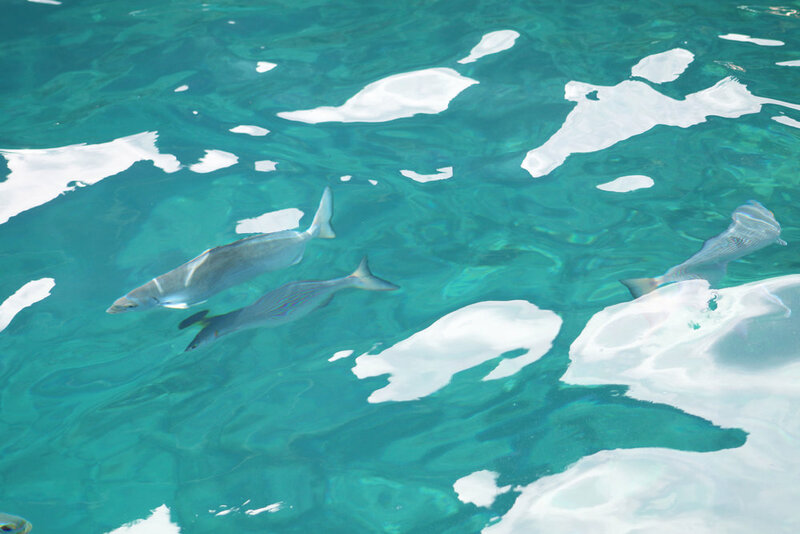 If you keep your eyes on the water, you can spot glistening fish and playful dolphins doing flips in the ocean. Capturing a good photo of the dolphins was so tough! A man zooming by our catamaran on a jet ski. Fish swimming near the catamaran as everyone else was snorkeling. 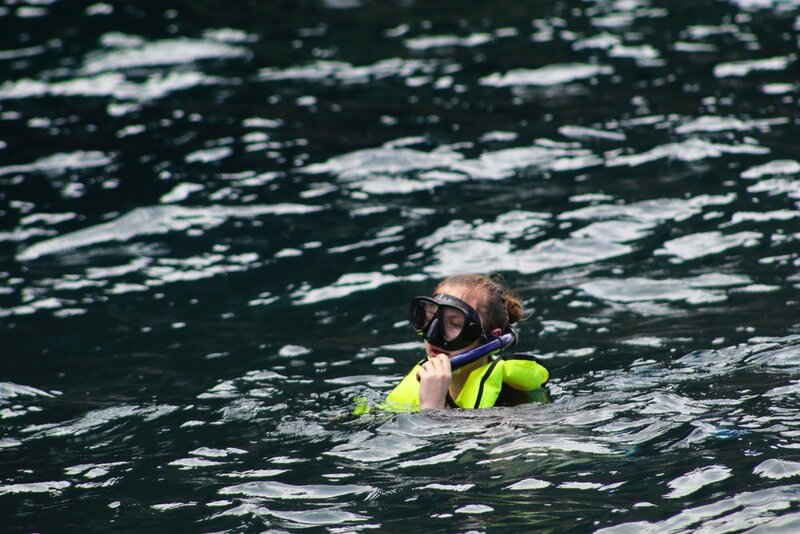 The tour guides made sure everyone had their gear to snorkel before exiting the back of the boat. Some people even brought along GoPro cameras to get underwater photos and videos! I recommend knowing how to swim if you're going to get in the water, but there is a guide in the water during this portion of the tour. 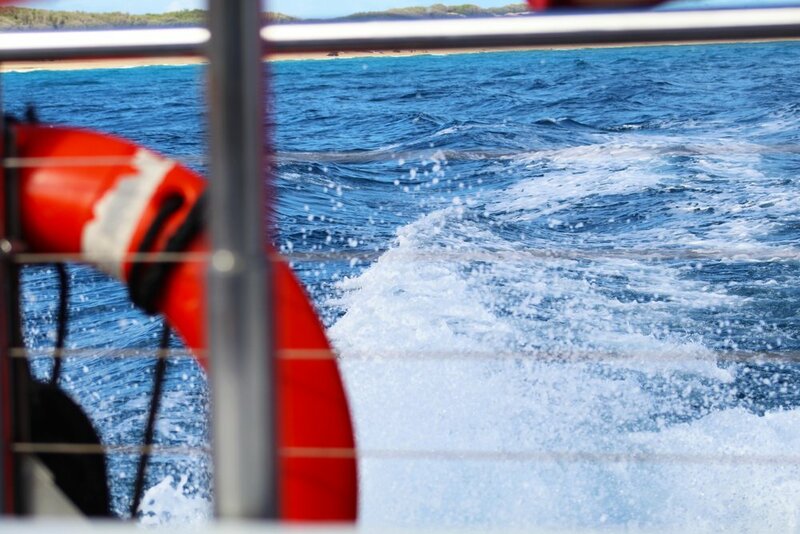 If you don't know how to swim, you're free to chill on the catamaran. Honestly, this is one of the best times to get photos of the island while the boat is still. I didn't fix up the prettiest plate, but lunch is served after snorkeling. We had options to make our own sandwiches and a Hawaiian rice salad with several drink options including wine and beer. Fresh macadamia nut cookies were served for dessert. On the way back to the shore, I listened to music and even took a nap. I'm happy that I got to do something new and I had time to take in the natural beauty of the island. The best part was that I had very little to no cellular service at all...and it was fantastic. In a world so obsessed and connected to our devices, it's nice to be able to disconnect sometimes. No emails, no phone calls, no social media updates, and I loved every moment of it on Akialoa.